I am most definitely not the target audience for this particular energy drink, but given that it exists I had to give it a try. 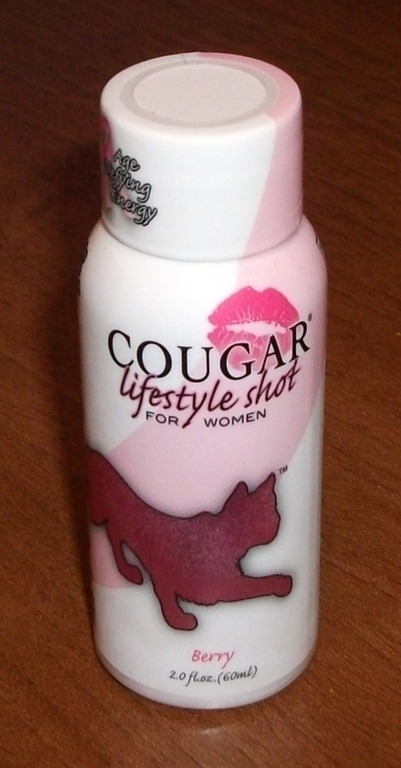 Cougar lifestyle shots, for women; advising on the bottle to provide “Age Defying Energy” are aimed at, shall we say, the older lady who… actually I’m going to let The Urban Dictionary handle this one. After drinking this I can’t (or won’t?) say that I suddenly found myself eying up younger men, but I did get the rush of energy expectedly provided by these drinks. The caffeine hit comes from the usual added caffeine and more unusually green tea extract. In fact, if you check out the product’s web site and look through the ingredients, you’ll see a whole host of natural additions which are aimed at women (you drink Aloe Vera?? Apparently so.) . The flavour was very nice. The bottle says Berry, but I’d say it was the same flavour as the cherry powder in a Double-Dip (remember them?). I know it’s not aimed at me but it tasted great, gave me the wanted caffeine hit, it is very different to Red Bull and has zero calories.